Trade shows and conferences are now regularly hosting an event called the “Reception on the Trade Show Floor” or the “Welcome Reception on the Exhibit Hall Floor.” These events are designed to draw attendees to the trade show floor and hold them there, so exhibitors get an extra opportunity to meet and connect with their potential prospects. Most of these events feature some kind of open bar, food stations, and even some light background music in some cases. The atmosphere is more relaxed. There are sometimes cocktail tables set up in the wider aisles. Attendees tend to wander around the exhibit hall with a cocktail and chat with friends and exhibitors. Because there are free drinks, almost everyone attends these events. A Reception on the Exhibit Hall Floor is their opportunity to create a hospitality event in their trade show booth, while someone else pays for the food and beverage, invites the guests, and pays for the venue. The only thing missing is branded entertainment. It’s the perfect combination. Attendees are relaxed and open to having some fun, and they’re very willing to congregate around the booth and watch the entertainment. They see the activity at the booth, and they want to come over to see what’s happening. Everyone enjoys the entertainment and gets involved in the show at the your booth. That means more exposure to your brand and your sales representatives. With entertainment that features a short, direct message about the outcomes your clients get by working with your company, your booth will help position your company “top of mind” as your client’s only rational choice. The typical trade show distractions are much lower - other exhibitors rarely give speeches or live demonstrations at this time, and many exhibitors actually reduce their booth staff (or simply enjoy the reception themselves). Few attendees schedule meetings during the cocktail receptions, and very few will be focused on business during the social time. What’s the secret to grabbing tons of trade show traffic from the reception on the exhibit hall floor? You can’t do anything until you control the attention of people in the aisle. A great trade show entertainer knows how to start a crowd, and that “crowds beget crowds.” After he stops a few people, more and more people will surround your booth to watch the show. At the 2012 ISM Show, in fact, every attendee on the trade show floor was surrounding the Kaman Industrial Technologies Booth to watch me entertain. We were the only booth with live entertainment, and everyone wanted to be part of the incredible magic and high energy show. Advertise. An exhibitor’s pre-show advertising can help support the performer in the booth, too. Announce that you’ll have entertainment on social media, email campaigns, and even in your print campaigns before the show. The people who already know you - or think they do - will ignore your trade show booth if they think you don’t have anything new or interesting to offer them. Offering live entertainment is a great way to make sure they plan to spend some time at your booth, so you can capture their attention (and then offer them your products or services). Location. Location. Location. At a lot of these events, crowds will form at the bars and food stations. Ideally, your booth should be located near one of these events. Your booth entertainer can simply walk into the crowd, capture the attention of a few people, and draw them over to your booth to start the show. As the show starts and the laughs and applause come from your booth, the crowd will grow. If your booth is not near the bar, boosting your pre-show advertising and social media will help draw attendees to your booth. Give people a reason to seek out your booth. Advertise your trade show attraction, so people know you’re doing something fun and interesting at your booth during the reception. What you say and when you say it. This is not a good time for a deep product talk involving complicated math. 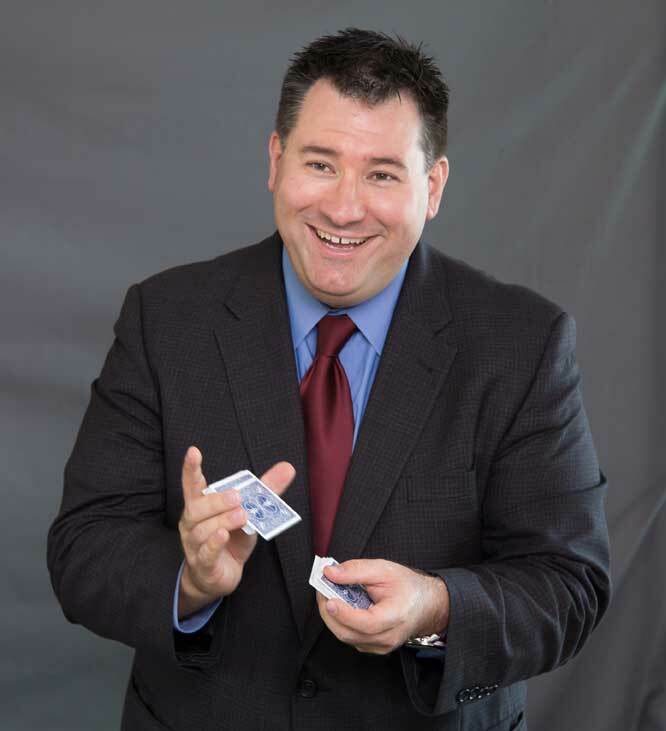 This is a great time have a lot of laughs, enjoy some really incredible magic and mind-reading, and create an indelible memory of your booth and your company. The show should mention the outcomes your clients get by working with your company, and it should definitely mention your company’s name. Leave the “selling” for regular trade show time. Attendees aren’t as open to a pitch during the hospitality event, so give them just enough that they want to come back and learn more tomorrow. Engage the audience. Let your booth staff mingle in the crowd to watch the show with the attendees. There will be very little sales content in the show, so everyone will be there to watch the performance and have some fun. Your booth staff will laugh along with the attendees at the show. During breaks in the show, your team can use the magic as an ice breaker to start talking with show attendees and get to know them. The emphasis here is on connection, not selling. The magic becomes a common point of connection that will break down traditional “salesman” barriers and reposition the relationship. Rather than being “salesman” and “customer,” the entertainment repositions both people as “audience members,” so they can talk freely about their common experience while watching. They can connect by talking about what they saw, other magicians they’ve seen, and any other topic that comes to mind. If they’re comfortable during the social time, clients will be more comfortable approaching you with business related questions. Plan to re-engage. The next day, when the trade show re-opens for “regular exhibit hall hours,” follow the same strategy you would if you’d hosted your own hospitality event the night before. Attendees will remember having visited your booth and watching the magic, and they’ll remember meeting your booth staff and the friendly conversation they had the night before. The entertainment will still stop traffic. The benefits and outcomes described during the magic performance will create interest in your product offering. Plus, since your customers already met your booth staff at the reception, your ideal prospects will feel more comfortable entering the booth and asking questions of your booth team. It’s a workable, effective strategy, and the hardest part - handling the food and beverage, arranging the venue, and inviting your guests has already been done for you! Ready to have the last step - incredible entertainment that makes your booth stand out - done for you as well? Mike Duseberg builds a crowd at your booth, broadcasts a message that finds your ideal clients, and brings in qualified leads. Check out www.TradeShowFunnel.com with further information, a free five minute “mini-webinar” on trade show tactics, and other free information.